First official political mentioning of a potential project Deutsches Haus in Ho Chi Minh City by the Foreign Minister of the Federal Republic of Germany, H.E. Dr. Frank-Walter Steinmeier on the occasion of his visit to Hanoi with a German Business Delegation, which included Prof. Dr. h. c. mult. Dipl.-Ing Architect BDA Meinhard von Gerkan, a founding partner of GMP Architects Gerkan, Marg and Partner in Hamburg/Germany. Visit of the Foreign Minister of the Federal Republic of Germany H.E. Dr. Guido Westerwelle. 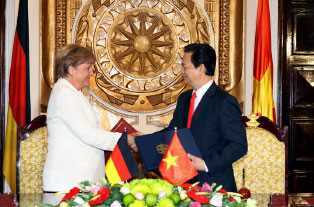 During his visit he initiated the process of drawing up the Hanoi Declaration on the strategic partnership between Germany and Vietnam. State visit of the Chancellor of the Federal Republic of Germany, Dr. Angela Merkel. Signing Ceremony of the 1st Government Agreement for Deutsches Haus Ho Chi Minh City with the Prime Minister of the Socialist Republic of Vietnam, Mr. Nguyen Tan Dung, as part of the “Hanoi Declaration”, sealing the strategic partnership between the Federal Republic of Germany and the Socialist Republic of Vietnam. "… I would like to add from my side that there is Deutsches Haus Ho Chi Minh City as a new project. This will attract many commercial enterprises in Ho Chi Minh City …"
"...Of course, Deutsches Haus Ho Chi Minh City which has now been agreed upon, is a very important aspect, because with it the German business will be able to present itself united and collectively in Ho Chi Minh City and it will express our desire to work together on Vietnam’s success. You have the ambitious aim of becoming an industrial nation by 2020, and in this undertaking, Germany would like to support Vietnam. We believe that in this way we will also be able to create favorable conditions for our economy…"
Standing from left to right: H. E. Mr Nguyen Sinh Hung, Chairman of the National Assembly of the Socialist Republic of Vietnam and the Minister for Foreign Affairs of Germany, H.E. Dr. Guido Westerwelle. Sitting from left to right: Vietnamese Ambassador to Germany, H.E Dr. Nguyen Thi Hoang Anh and the Minister of State at the Federal Foreign Office of Germany, H.E. Ms. Cornelia Pieper. 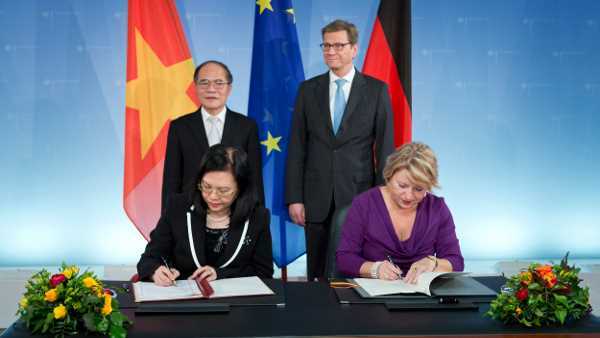 Signing Ceremony of the 2nd Government Agreement on Deutsches Haus Ho Chi Minh City between the Socialist Republic of Vietnam and the Federal Republic of Germany by the Vietnamese Ambassador to Germany, Ms. Nguyen Thi Hoang Anh, and the Minister of State of the Federal Foreign Office of Germany, Ms. Cornelia Pieper, in Berlin. The tender from the Federal Foreign Office of Germany for design, construction and operation of the building was awarded to the "Investor" Deutsches Haus Vietnam Invest Ltd. (Hongkong). From left to right: H.E. Mr. Lê Hoàng Quân (Chairman of the People's Commitee of Ho Chi Minh City) and Mr. Horst Geicke (Chairman of Deutsches Haus Ho Chi Minh Stadt Ltd.). The Ho Chi Minh City People's Committee Chairman, Mr. 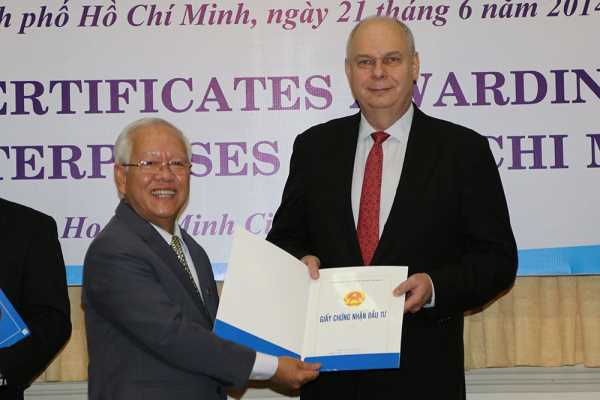 Le Hoang Quan, hands over the Investment Certificate to the Chairman of Deutsches Haus Ho Chi Minh Stadt Ltd. for the establishment and the implementation of the investment project Deutsches Haus Ho Chi Minh City. Construction Permit by the Department of Construction of Ho Chi Minh City for Deutsches Haus Ho Chi Minh City. Set up of construction site and start of construction work. 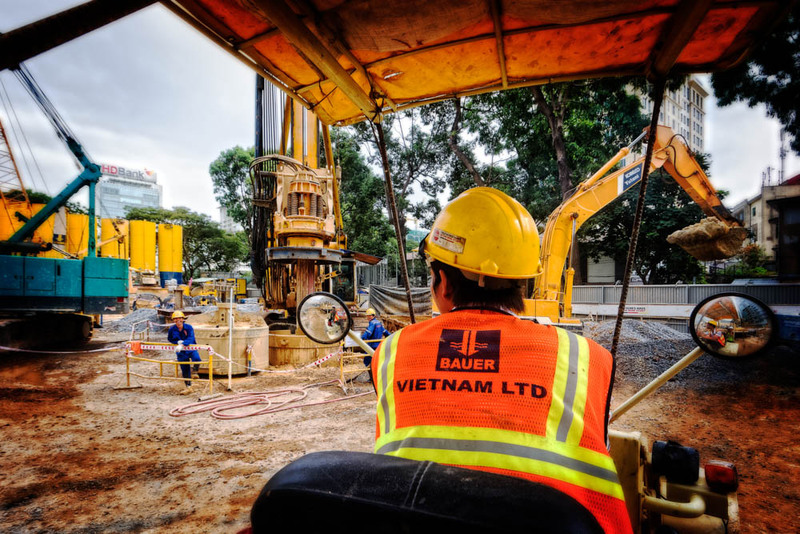 Bauer Vietnam constructed an 800 mm thick and 45 m deep diaphragm wall on a total length of 118 m; a secant pile wall with a diameter of 880 mm and a depth of up to 33 m on a total length of 123 m, simultaneously constructed adjacent to the existing Kumho office-building and the Intercontinental Asiana Hotel. The work also included the construction of eight bored piles with diameters of 1,500 mm and 39 grouted piles with diameters of 2,000 mm – all between 60 and 80 meters long – including kingposts for a semi-top-down basement construction. From left to right: Mr. Horst Pudwill (Investor of Deutsches Haus Ho Chi Minh City), Mr. Horst Geicke (Chairman of Deutsches Haus Ho Chi Minh City), H.E. Vu Huy Hoang (Minister of Industry and Trade of the Socialist Republic of Vietnam and President of the Vietnam-Germany Friendship Association), H.E. Ambassador Nguyen Vu Tu (Director General, Department of Foreign Affairs - Ho Chi Minh City, Ministry of Foreign Affairs of the Socialist Republic of Vietnam) and Mr. Bernd Dietel (Investor of Deutsches Haus Ho Chi Minh Stadt). On 24 October 2015, Deutsches Haus Ho Chi Minh City celebrated their official groundbreaking and cornerstone laying ceremony on the construction site of Deutsches Haus Ho Chi Minh City. Following the successful completion of the foundation in March 2015 by Bauer Vietnam Ltd., Hoa Binh Corporation as our appointed basement contractor has commenced the basement construction development by semi top-down method with king post-system, which has been installed prior to the basement construction during the works for the foundation. The excavation for the level-1 basement has started in April 2015 and ended November 2015. More than 60,000 cubic meters of soil has been excavated and environmentally compliant disposed. More than 10,400 cubic meters of concrete, 1,370 tons of rebar, 130 tons of king posts have been used as materials. During the construction of the basement of Deutsches Haus Ho Chi Minh City, 1 tower crane, 6 excavators, 2 bulldozers and other specialized equipments have been used. By end of November 2015, the 22 meter deep, 4-level basement has been completed within 6 months to create 13,764 square meters for parking with the flexible capacity for approx. 179 cars and 1171 motorbikes. During the construction-time with 338,000 man-hours no accident has been reported. Hoa Binh as main contractor, REE M+E as MEP contractor and Yuanda as façade contractor have been engaged. 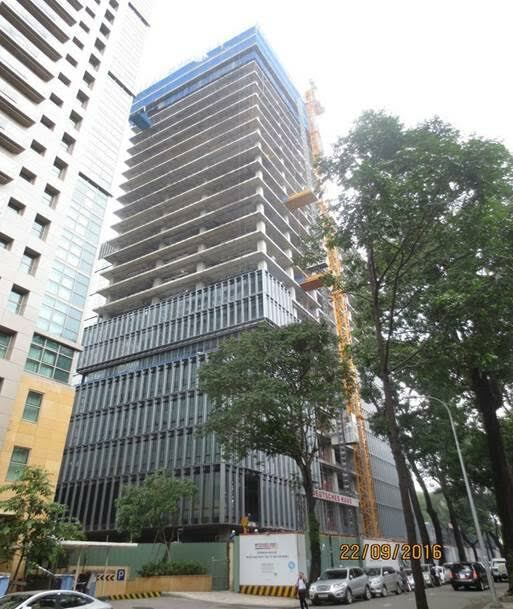 The contractors finished casting of level 26 slab, column and liftcore from level 1 to level 26. Currently, the installation of formwork and rebar for the column and lift core from level 26 to level 27 and for the level 27 slab are ongoing. From left to right: Prof. Meinhard von Gerkan (Architekten von Gerkan, Marg & Partner), Mr. Horst Pudwill (Co-Chairman & Investor of Deutsches Haus Ho Chi Minh Stadt Ltd.), Mr. Horst Geicke (Chairman & Investor of Deutsches Haus Ho Chi Minh Stadt Ltd.), Ms. Phan Thị Mỹ Linh (Vice Minister of Construction of the Social Republic of Vietnam), Dr. Frank-Walter Steinmeier (Federal Foreign Minister of the Federal Republic of Germany), Mr. Lê Văn Khoa (Vice Chairman of the HCMC People’s Committee), Mr. Bernd Dietel (Co-Chairman & Investor of Deutsches Haus Ho Chi Minh Stadt Ltd.), Mr. Vũ Quang Minh (Assistant Minister of Foreign Affairs) & Mr. Trương Văn Bằng (General Director of Deutsches Haus Ho Chi Minh Stadt Ltd.). On 01st of November 2016, Deutsches Haus Ho Chi Minh City celebrated the official topping out ceremony. The event took place at the construction site of Deutsches Haus Ho Chi Minh City at 33 Le Duan Street in Ho Chi Minh City. More than 400 guests from the German, Vietnamese and International business community in Vietnam, representatives from the Vietnamese and German governments and members of the Diplomatic Corps attended the event. The ceremony was witnessed by the Federal Foreign Minister of Germany, Dr. Frank-Walter Steinmeier, the Vice-Minister of Construction of the Socialist Republic of Vietnam, Ms. Phan Thi My Linh, the Vice-Chairman of the Ho Chi Minh City’s People Committee, Mr. Le Van Khoa, the Ambassador of Germany from the Embassy of the Federal Republic of Germany in Vietnam, Mr. Christian Berger, and the Consul General of the Federal Republic of Germany in Ho Chi Minh City, Mr. Andreas Siegel as well as the investors of Deutsches Haus Ho Chi Minh City, Mr. Horst Geicke, Mr. Bernd Dietel and Mr. Horst Pudwill. Hoa Binh as main contractor, REE M+E as MEP contractor and Yuanda as façade contractor have been engaged. Currently, Main contractor is doing the installation of the structure of photovoltaic panel on roof, finishing works in lift core and basements, installation of ceiling frame on Level 18 and installation of raise floor on Level 3. MEP contractor is installing pipe & cooling tower, installing cable tray/ trunking, air duct, chiller cooled water pipe, fire-fighting pipe & wiring on Level 21-22, and installing air grille, sprinkler head, lighting fixture & smoke detector on Level 16-17. Façade contractor is installing facade panel on Level 20-21. Hoa Binh as main contractor, REE M&E as MEP (Mechanical, Electrical & Plumbing) contractor, and Yuanda as façade contractor have been engaged for the lighthouse project Deutsches Haus Ho Chi Minh City, a symbol of the strategic partnership between Vietnam and Germany. At the end of the fourth quarter of 2016, our main contractor Hoa Binh has already completed the casting of roof slabs and the installation of ceiling frames on Level 3-5, 8-12, 14-18. The installation of lighting fixtures, smoke detectors, sprinkler heads (above the ceiling) and air grilles on Level 3-5, 8-12, 14 & 15 have been finished by our MEP contractor REE, and our façade contractor Yuanda has completed the installation of façade panels on Level 2-19 as well. Currently, our entire team is working at full speed on the development of the building and on September 1, 2017 Deutsches Haus Ho Chi Minh City will open its doors! In the first quarter of 2017 our main contractor Hoa Binh has already removed the passenger & material hoist. Up to level 19 the installation of ceiling frames of mineral acoustic ceiling panels has been finished. The installation of the main pipes of the fire fighting system in the fire pump room in basement 1 has been completed by our contractor for the firefighting package Duc Phuong Trading Corporation. 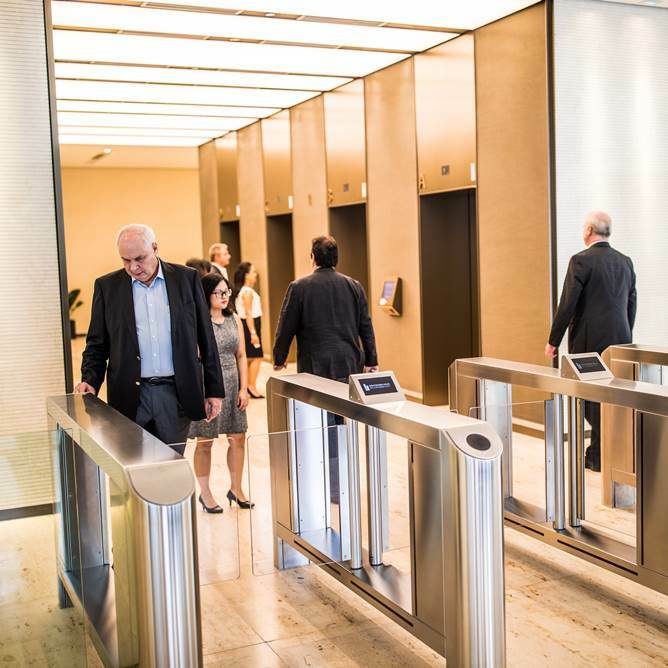 Thyssenkrupp who is engaged as contractor for the lift package has installed 1fire/ serviced lift and 1 high-speed office lift with destination control for the low zone from level 1 to level 12 which are both already in operation. Our MEP (Mechanical, Electrical & Plumbing) contractor REE M&E has completed the installation of lightings, smoke detectors, sprinkler heads and return/supply air grilles above the mineral acoustic ceiling panels on level 11 and 14-16. Currently, Hoa Binh is doing the landscaping around the building, the finishing works on level 7, 14, 21-25 for the technical rooms and the installation of the raised floors on level 3-5, 8-10 & 12. Besides, REE M&E is installing the water tank and the main cooled water pipes for the cooling tower on level 26, and the façade contractor Yuanda is installing the façade panels on level 26 and at the opening of the hoist area. With the end of the second quarter of 2017 our main contractor Hoa Binh has already finished the installation of ceiling frames for the mineral acoustic ceiling panels on all office levels and the installation of corridors on level 3, 9, 10 & 14. Hoa Binh is currently doing the landscaping around the building, finishing works for the whole building, installation of raised floors on level 25 and installation of mineral ceiling tiles on level 22-25. Our contractor Duc Phuong Trading Corporation for the firefighting package is doing the testing & commissioning of the fire-fighting systems for the whole building prior to the final inspection of the Fire Fighting Police Department by mid of July 2017 at the latest. 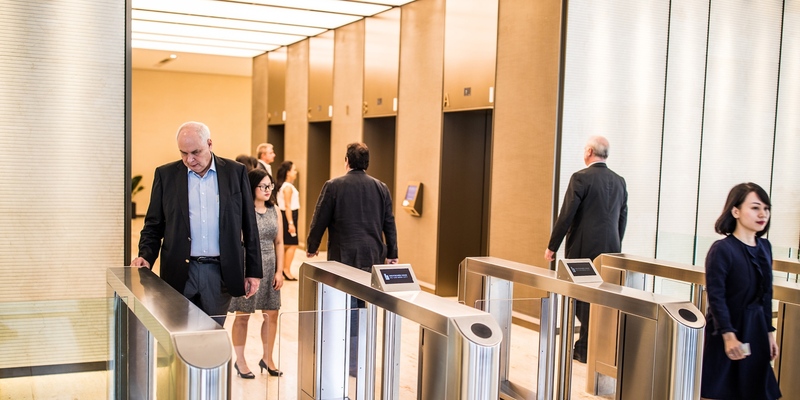 ThyssenKrupp who is engaged as contractor for the lift package has already installed the high-speed office lifts with destination control for the high-zones from level 14 to level 24. Currently, they are doing the testing & commissioning of the lifts, which will be in full operation for the tenants at the beginning of July 2017. Our MEP (Mechanical, Electrical & Plumbing) contractor REE M&E has completed the installation of lightings, smoke detectors, sprinkler heads and return/supply air grilles above the mineral acoustic ceiling panels for all levels. Currently, our façade contractor Yuanda is doing the installation of the canopy for the main entrance & doors at level 1, and the installation of the sun shading louver of the double-skin façade on level 18. With the upcoming opening of Deutsches Haus Ho Chi Minh City on September 1, 2017 our entire team is working at full speed on the final stages of the development of the building! On the 1st of September 2017 Deutsches Haus Ho Chi Minh City has finally opened its doors! Our entire team has worked at full speed on the final stages of the development of the building so that with the “soft opening” of the building on the 1st of September 2017 all public areas have been completed, the media wall and reception counter in the lobby have been installed, and the basement for parking went into operation, so that the first office tenants can move in! The landscaping around the building, the finishing works for the lift lobbies, the installation of corridors, the installation of raised floors, and the installation of the premium mineral-fiber ceiling tiles on all 26 levels have been finished by our main contractor Hoa Binh. Our contractor Duc Phuong Trading Corporation for the fire-fighting package has finished with the testing and commissioning of the fire-fighting systems and optimized the system for the whole building. In addition, ThyssenKrupp who is engaged as contractor for the lift package has installed the speed gates with key access control, the high-speed office lifts with destination control for the low-zones from level 1 to level 12, and the high-zones from level 14 to level 26, which are already in full operation, and have also finished the fit-out for the lift cars. The installation of lightings and air grilles above the premium mineral-fiber ceiling panels for all levels has been completed by our MEP (Mechanical, Electrical & Plumbing) contractor REE M&E. 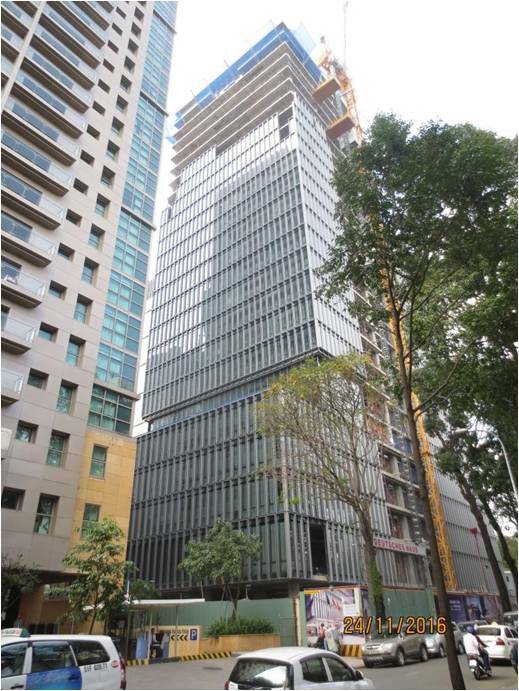 Furthermore, Yuanda who is our façade contractor has installed the canopy for the main entrance and doors at level 1, and finished the installation of the sun shading louver of the double-skin façade on all 26 levels and the configuration of the louver blind controls. Highlight for the upcoming months of Deutsches Haus Ho Chi Minh City will be the opening of the in-house multifuntional conference-, event- & exhibition area on level 2 and fitness center on level 3, ensuring that “wellness” needs are met for tenants, and the business center on level 11 in November 2017. Deutsches Haus Ho Chi Minh City is also expecting to held an opening party for its exquisite, spectacular new dining venue in a sophisticated and inviting atmosphere, featuring a restaurant with sky bars on the largest terrace of Ho Chi Minh City with a fantastic view over the city’s skyline on level 20 & 21 of the building by the end of this year. The “Grand Opening” of Deutsches Haus Ho Chi Minh City is anticipated to be in the 1st quarter of 2018 and until then the Consulate General of the Federal Republic of Germany will also relocate to Deutsches Haus Ho Chi Minh City on level 6 with a separate entrance and a secure lobby on the ground floor. On May 2, key handover to the Consulate General's entry into the 6th floor of Deutsches Haus Ho Chi Minh City in 33 Le Duan, District 1 was made. Deutsches Haus Ho Chi Minh City, located in the city center of the South Vietnamese metropolis, is one of the lighthouse projects of German-Vietnamese cooperation. Many well-known German companies and service providers such as Siemens, adidas and Commerzbank as well as institutions such as the German Academic Exchange Service (DAAD) have already opened offices in Deutsches Haus Ho Chi Minh City. The Goethe-Institut and the Delegate of German Business (AHK Vietnam) will follow in the course of the next months. The Consulate General is looking forward to welcoming visitors to the new premises from end of May.